I had a bit of a hard time coming up with a title for this post because Swedish saft isn’t exactly a syrup, or a drink, or just juice. 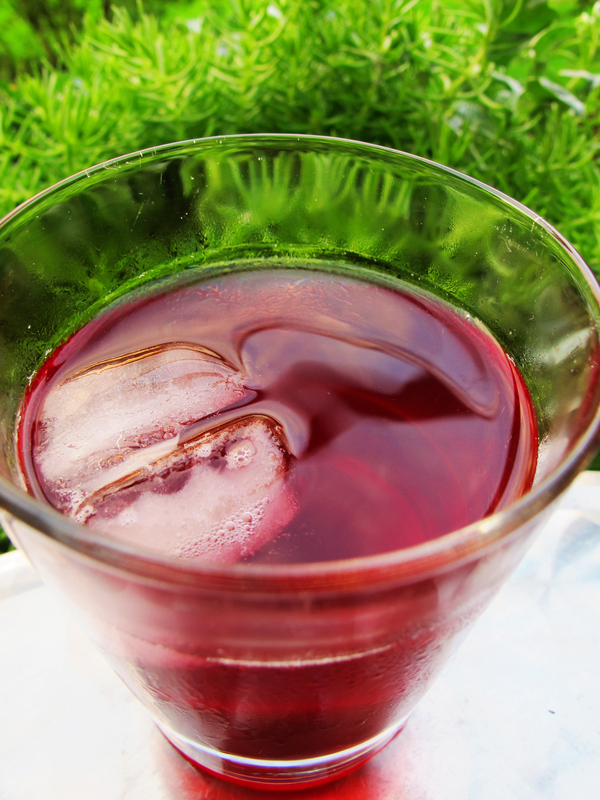 It is fruit and/or berry juice boiled with sugar to create a concentrate that becomes drinkable when water is added. In British English it is squash or cordial, but for the life of me I can’t come up with an American English term for it. If someone can enlighten me on an American English term besides concentrate, I’m all ears. In order to be considered a saft the fruit/berry content needs to be at least 9%. Where I grew up no one was making saft that I was aware of and black currants were not commonplace like they are in Sweden. Here it seems to me that the majority of people have either a red, or black currant bush growing in their gardens, and quite often they have both. And when you have an overabundance of lingonberries, currants, strawberries, raspberries, rhubarb, apples, blueberries, cherries, elderberries (you get the idea), saft is a fun and interesting alternative for using up your harvest. It can even be made with elderflowers or lilacs. I had some extra black currants kicking around and decided they were destined for saft. The idea behind saft is that the sugar in the concentrate acts as a preservative which was key in pre-refrigeration days. Although making saft may not be as commonplace today as it was historically, it isn’t uncommon here and the Swedes have a nifty gadget called a saftsil (juice strainer) that is immensely helpful in the process. I tried to find a good source in English to purchase one online but wasn’t successful. Cheese cloth (muslin) set into a fine mesh strainer would certainly work if you can’t manage to get your hands on a saftsil. Mine is manufactured by Jonas of Sweden and I picked it up at a local grocery store for 99sek (about $15). For some reason I resisted purchasing one for three years but in the spirit of making saft like a Swede, I caved and am happy to report I’m pretty darn excited about this alien looking gadget. The ‘feet’ clamp onto whatever container you are using so the strainer can sit steadily above it. No doubt it will come in handy when it’s time to strain the crème de cassis come December. But for now, it’s in the saft making business. This was my first attempt at making a berry saft and based on the result, it will not be my last. The recipe I used was from Vår Kok Bok which is such a reliable Swedish recipe source. They have some excellent guidelines and a variety of combinations that I’m excited to translate and share. Saft can be made from either fresh or frozen berries and/or rhubarb. Note that the amount of water used varies depending on the ingredients. Some recommended saft combinations are strawberries with rhubarb, gooseberries, or red currants; raspberries with rhubarb, blueberries, or red currants; blueberries with red currants; sweet or sour cherries with gooseberries, rhubarb, or red currants; and elderberries with red or black currants or sour apples. The Vår Kok Bok recipe calls for natrium benzoate as a preservative which was not used historically. I have an old Swedish cookbook from 1925 and one from 1952 and the ingredients are just berries, water, and sugar with proportions similar to below. So I prefer to skip the preservatives since the recipe calls for 3/4 the amount of sugar to juice and just to be on the safe side I keep it in the refrigerator or freezer. 1. Wash the berries and remove any stems. They do not need to be pitted or thawed if frozen. Rhubarb should be cut into chunks. 2. Measure the ingredients and select the appropriate amount of water. Juicy cherries can be cooked without water. 3. Bring the water to a boil in a large pot and add the berries and/or rhubarb. Simmer until they collapse, about 10 minutes, occasionally pushing against the sides of the pot or using a potato masher to crush and stir them during cooking. 4. Pour the cooked matter into a saftsil or fine mesh strainer lined with cheesecloth and let it self-strain into a large, clean container for 20-30 minutes. 5. This part is optional – to get a bit more taste out of the berries you can return them to the pot with a little more water (a cup or so) and cook them again for 3-4 minutes, then strain them into the first batch of juice. 6. Measure the strained juice and put it in a clean, large pot. Calculate the appropriate amount of sugar and add it in several additions to the juice, stirring well, as you bring the saft to a boil again. 7. When all of the sugar has dissolved, remove the saft from the heat and let stand, undisturbed, 5 minutes. Remove any scum that has accumulated on the top before transferring the saft to a clean container for storage in the refrigerator or freezer. 8. To serve, dilute the saft with water to taste and serve chilled or over ice. I generally prefer about a 1:6 ratio. Enjoy! Hi Maia! In Scotland they call it diluting juice too! Not american, but maybe it helps? Thanks Aliki. That’s good to know. It will be interesting to see what other suggestions come up. Hey little Sister, what would it take to get you to send one of those nifty little devices this way? It looks fantastic for juicing items. I can send you one. I’ll have to see if they have any left. I was a bit late picking mine up and it was the last one on the shelf, but maybe they will be restocking. Enjoyed this entry. I’ve been canning for almost 40 years and DH and I grow almost all our own fruits&veggies. Everything from pears, apples, peaches, blackberrys, raspberries, currants, grapes, strawberries, sour cherries etc. I put up anywhere from 550-700 jars food a season. I’m looking for recipe to can my own juice that will sit on a shelf up to a year. Have any ideas on processing your recipe for shelf storage? I’d also love one of those devices to strain fruit. I get sick of the cheesecloth-ugh. My hands are black from berries and I’m only half way thru our 70 gallon crop. Be glad to send cash in advance. Please advise. I grew up in Northern Minnesota by the way next door to some lovely Swedes all up and down the lakeshore. The Olsons and Nilsons and Pedersons etc were great friends and we exchanged lot of recipes. Love to make Kottballer (sp?) and lutefisk when I can and always enjoy my potato pancakes with my homemade applesauce and my fave sugar browned taters fresh dug from our garden! PS I gave my husbands blog address instead of mine. Mine isn’t quite ready to be published but I collaborate with him on cards, announcements, and other works of ready to print articles. Thanks for your comment Chris. I am envious of your garden and your canning abilities. I’m afraid I can’t offer any advice in the canning regard. It is something I haven’t delved into, but you might check out one of the canning sites like kerr or ball. 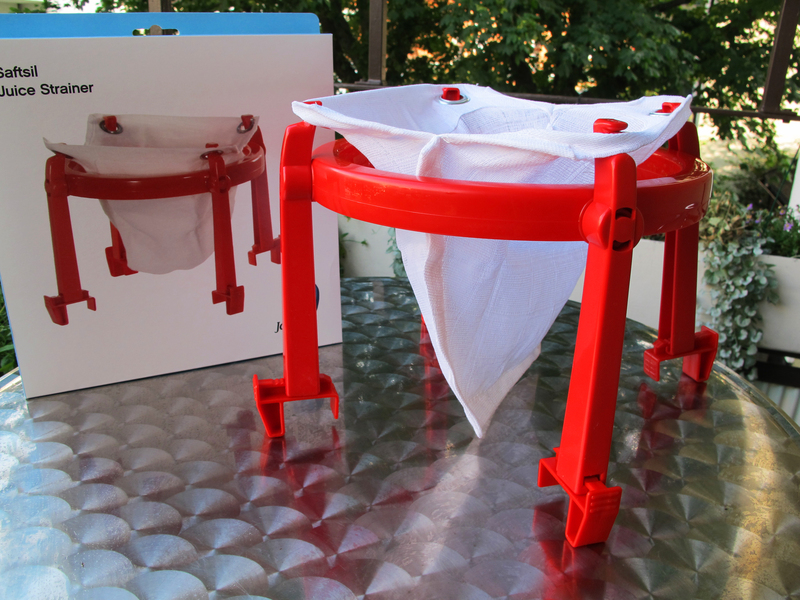 In terms of the strainer, if you are in the U.S., maybe you could purchase one of these http://www.amazon.com/Norpro-Jelly-Strainer-Stand-Bag/dp/B0012C5ZPK. It’s not exactly the same, but serves the same purpose. Or do an online search for jelly strainers. I am a Swede living in Wisconsin and had the same problem to explain saft but according to my wife who is American it is an ade. So Svartvinbärssaft would be “Currantade” (compare with Lemonade:). Thanks for the suggestion. I hadn’t really considered calling it an “ade.” I would more readily associate and ade with citrus, but the suggestion is definitely something to think about. Thanks for taking the time to comment. I don’t have any better ideas for an analogous name in American English, so I guess I’d be another vote for black currantade. I grew up in the States but spent some time living in Sweden, where I often drank svartvinbärssaft and jordgubbssaft. When a British friend gave me a glass of Ribena today the taste took me back. I didn’t put it together at first, but… svartvinbärssaft! I found out from her that it’s an incredibly popular drink in England, and then read the fascinating history at http://en.wikipedia.org/wiki/Ribena. Apparently with other foods high in vitamin C unavailable during World War II due to blockades, this stuff was widely distributed and paved the way for a general British taste for black currant. The Swedish taste for it might be more related to the point you made, that it’s common for families to have currants right at hand just waiting for something to be done with them. Have you tasted Ribena, by chance? Its an uncanny resemblance. Wikipedia mentions there being many forms of it, from concentrate to carbonated drinks to versions made with other fruits, but you can guess which one triggered my fond Swedish memories. What an interesting historical note about Ribena! Thanks so much for sharing. I have never tried it. I’ll have to remember to ask my British colleagues about it. Thanks for taking the time to comment!